The Ireland Institute of Pittsburgh is pleased to offer the Pittsburgh J-1 Summer Work Travel Visa Program. You can work anywhere in the US – we invite you to spend your time in Pittsburgh! – Post-secondary school students enrolled in and actively pursuing a degree or other full-time course of study at an accredited classroom based, post-secondary educational institution outside the United States. Students are eligible to work and travel in the U.S. for up to 4 months during their summer vacation. Employment: The primary component of the Exchange Visitor Program will be a work experience in the US in which participants will secure a position with a business or organization. Under the guidance of a mentor in the workplace, participants will gain valuable, hands-on experience and a new understanding for their field of interest. Each participant’s respective employer will determine the rate of compensation. Travel & Culture: Of course you don’t have to come to Pittsburgh – but if you do, you should know that Pittsburgh is within 500 miles of half the population in the U.S., and has an easily accessible international airport, within 90 minutes flying time from 20 U.S. states and Canada. Many destinations are within a day’s driving distance: New York City, Washington, D.C., the Jersey shore, Gettysburg, Philadelphia, and Chicago, as well as many points of interest in Western Pennsylvania. Thus, Pittsburgh is a great spot to start a regional or national exploration of the United States. 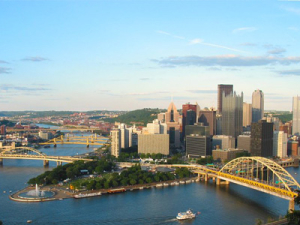 Pittsburgh offers many recreational opportunities, such as hiking, biking, boating, camping, an amusement park, shopping centers, movie theaters, three national sports teams, and a thriving art scene. Upon acceptance to the program, participants will be given a manual with information on the various transportation options available to them. Come spend your summer in the US – your invited to spend it here in Pittsburgh with us! Contact Rob Tierney at +001 412-394-3900 or rtierney@iiofpitt.org for information or to apply!